You need two things to enable your TI-84 Plus calculator to communicate with your computer: TI Connect Software and either a USB computer cable or a USB Silver Edition Cable. TI Connect is free, and the cable came bundled with your calculator. If you are no longer in possession of the cable, you can purchase one through the Texas Instruments online store. Go to the Texas Instruments website. Locate the Downloads drop-down menu and select Apps, Software & Updates. Under the Technology drop-down menu, select TI-84 Plus Family, TI-83 Plus Family. Click the Find button, scroll down, and select TI Connect Software. Follow the directions given during the downloading process. Make a note of the directory in which you save the download file. 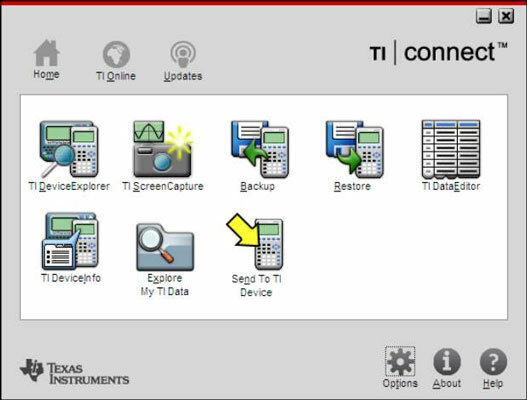 You can download an extensive TI Connect Help document (more than 100 pages) by clicking the Help icon in the bottom-right corner of the TI Connect Home screen. After you’ve downloaded TI Connect, you install it by double-clicking the downloaded TI Connect file you saved on your computer. Then follow the directions given by the TI Connect Installation Wizard. When you start the TI Connect program, you see the many subprograms it contains. A USB driver is automatically installed on your computer when you download and install TI Connect software. Now, you can recharge the battery on the TI-84 Plus C when you use the USB computer cable to connect your calculator with a computer. TI Device Explorer: Transfer files between your calculator and a computer. TI Screen Capture: Capture screenshots from your calculator. Backup: Back up the files stored on your calculator. Restore: Restore calculator files that have been previously backed up. TI Data Editor: Create or edit data variables. TI Device Info: Find information about connected calculators. Explore My TI Data: Opens Windows Explorer to work with calculator files. Send to TI Device: Opens a dialog box you can use to transfer files to your calculator.